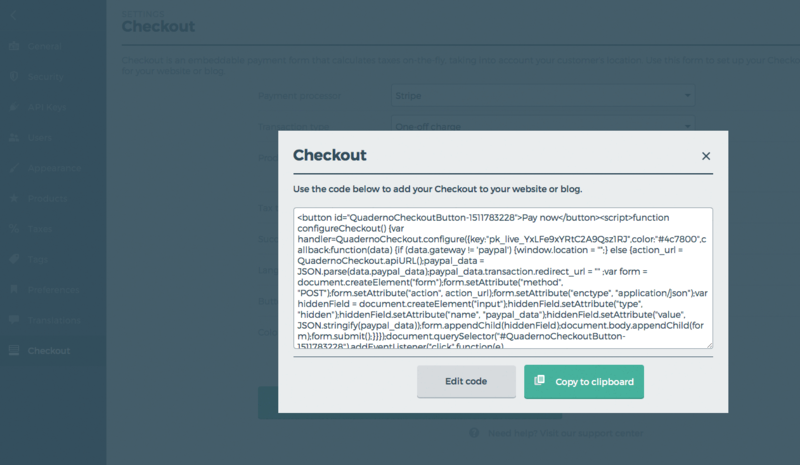 Checkout is an embeddable payment form that you can use to sell your digital products and subscriptions on WordPress, your own website, or wherever you've already built an audience online. 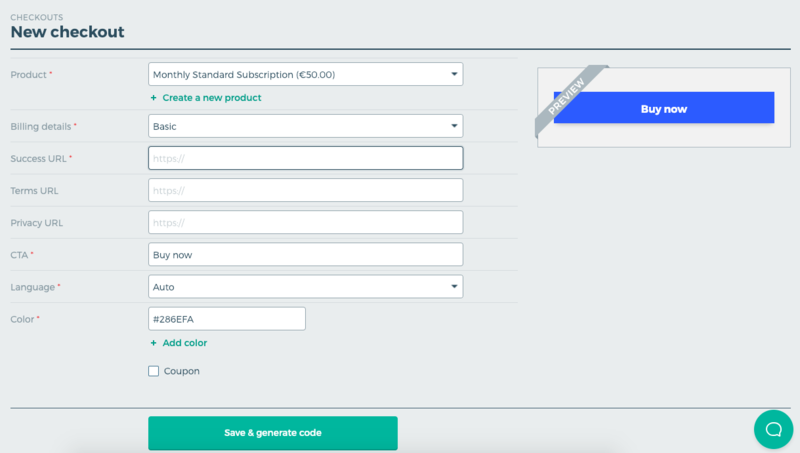 If you embed a Checkout form on your site, it displays a button to purchase a single product or subscription. When customers click the button, they are shown a checkout dialog to enter their billing data. Quaderno Checkout calculates taxes on-the-fly (if needed), takes the payment with your payment processor, and sends an automatic receipt to your customer. 1. From your Quaderno account, go to Checkouts. SKU: Stock keeping unit you use in your business. This should be the same SKU you use on other platforms. 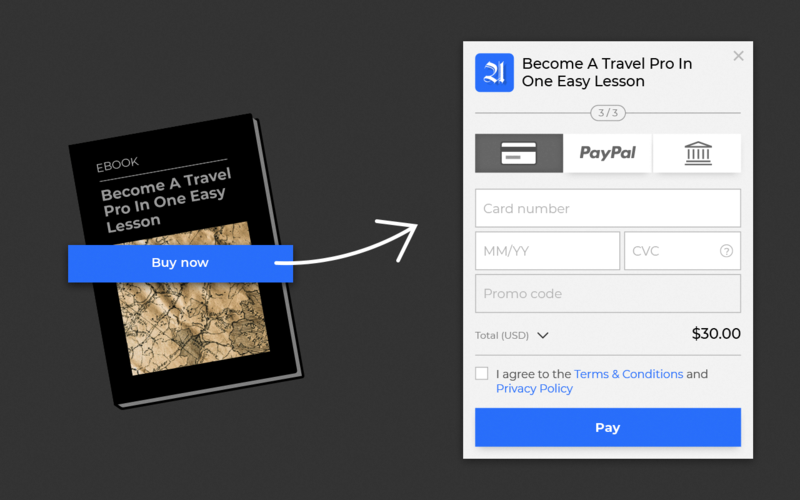 Type: The type of transaction: one-off charge or subscription. Name: The product description. This will appear as the line item description on the invoice. Price: Specify the unit cost of the product. Currency: Select the currency in which the product is sold. Tax class: Specify the tax class that applies to the product: eService, eBook, or standard. Display price: Specify if the taxes are included or excluded in the total amount. 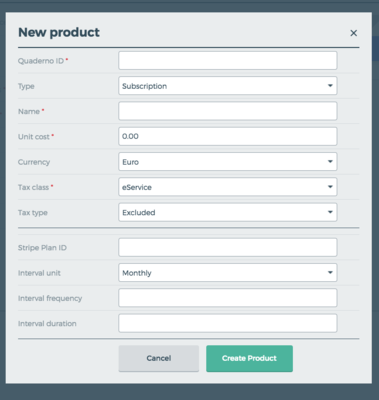 Stripe Plan ID: This is for subscriptions only: Where can I find my plan ID to add when creating my subscription checkout form? Interval Unit: For Paypal checkout forms, select the interval unit (daily, monthly, yearly). Interval Frequency: For Paypal checkout forms, select the frequency of the units when the charge should recur. 4. Click "Create product". You'll be brought back to the main "Create new checkout" form to complete the next steps. 5. Billing details: Select whether you’d like to collect Basic or Full billing details from your customers during checkout. We recommend collecting full billing details to ensure you are collecting tax IDs and sufficient location evidence where required. 6. Success URL: Add the URL of the page your customers should be redirected to when they purchase your product. 7. Terms URL: Add the URL of your terms and conditions page if you’d like to link to it on the checkout. 8. Privacy URL: Add the URL of your privacy conditions page if you’d like to link to it on the checkout. 9. CTA: Enter a call to action that you’d like to be displayed on the checkout button. 10. Language: Select a language for your checkout. If no language is selected, it will automatically use the language of your customer’s browser. The default is English. 11. Color: Select the color of your checkout. 12. Coupon: Select this box if you’d like your customers to be able to apply coupon codes (only available for Stripe subscriptions). 13. When you're done, click "Save and generate code". 15. Open the source HTML of the webpage where you want to display the Checkout form. 16. Paste the embed code within the HTML where you want the form to appear, then save your changes.